Following on from my previous easyJet post, after exploring Paris I took the train back to London for the Diamond Jubilee. 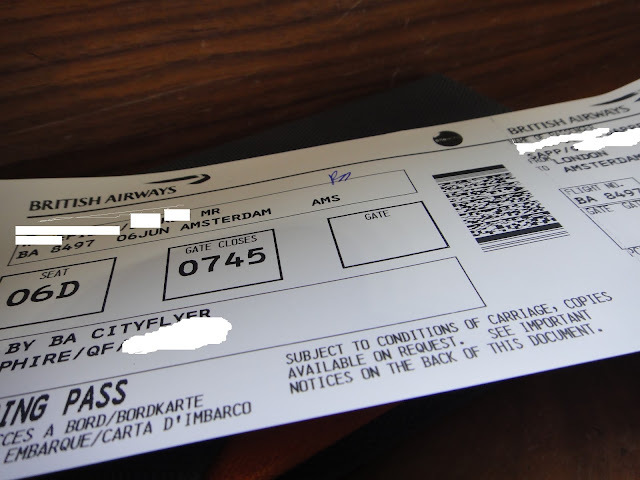 Once the Jubilee was all over I decided to head to Amsterdam and I took British Airways from London City. I have always wanted to land at London City but on this occasion I would only be experiencing a takeoff, I still found it all quite exciting. For those who don't know London City airport has a very short runway and very steep approach, one of the more interesting airports on earth. To get to the airport from my docklands hotel, I took the light rail. London City airport is very small and it's just a few steps from the curb to check in and then onto the departure gates. For this reason if you have no luggage you may check in at just 20 or 25 minutes before scheduled departure times. This is ideal for business travellers. On the downside the airport is so small it has no airline lounge and very few shops and restaurants. Check-in was completed quickly at the counter and my bags checked. I had pre selected seat 6D on the Embraer 170 and this was the seat I was allocated. Once I was checked in I passed through security and went plane spotting. Typical aircraft seen here are Avro RJ's, Q400's, Embraer's, Fokker 50's and ATR's. There was a delay to my flight of approximately 30 minutes. I had nothing to do other than sit and watch the aircraft movements, which I was happy to do. Eventually boarding was called and I made my way to the aircraft. Finally I was on board BA8497 to Amsterdam. This was my third flight on an Embraer 170, having flown on two previously with Virgin Australia. I find them quite comfortable with their 2 x 2 seating configuration and high ceiling, certainly much roomier than the competing CRJ700 and CRJ900. It wasn't long before we were underway and backtracking at high speed along the runway before a high power and very fast takeoff. We seemed to get up in no time and were climbing away nice and steeply into the clouds. There was 2 crew serving on board , both quite polite and I can't really fault the service. We even received a boxed breakfast containing a ham and cheese croissant and an orange juice. Perfectly reasonably for a flight of just 45 minutes, although the croissant was a little dry. The flight progressed very quickly and we were soon on descent into a very cloudy and wet Amsterdam. In fact we only saw the ground at about 500 feet. Thank the Instrument Landing System for getting us down in one piece. Flight was all but over but I took some time to stare at the sea of blue painted KLM aircraft. In particular I looked at the McDonnell Douglas MD-11. KLM being one of the very last operators of the passenger variant. I would like to fly on one but really have no need to go where they fly! More flight reports coming soon! Another great blog as always Daz. SO envious of you flying on the E-Jet out of LCY. Landing and departing at LCY is on my bucket list! Great work. Garuda used to fly MD-11s and I travelled on them a couple of times. A nice aircraft. thanks guys . I'll have to make sure I do a landing the next time at LCY.